I read about this book at Madame Bibi Lophile Recommends, and loved the sound of it. Just a man over the course of one day of his life, albeit an unusual day for him compared to all the others, brought about by the presence of a pigeon. I was intrigued by this man and wanted to know what he was like. How does one live alone and follow the same routine for 30 years of one’s life and be content to do so? Jonathan had just got up. As he did every morning, he had put on his slippers and bathrobe so that he could visit the shared toilet before shaving. Prior to opening the door, he laid an ear to its panel and listened to hear if anyone was in the hall. He did not relish meeting his fellow tenants, particularly not in the morning in pajamas and bathrobe, and least of all on the way to the toilet. Finding the toilet occupied would have been unpleasant enough; but the idea of meeting another tenant at the door of the toilet was nothing short of a nightmare of embarrassment. One day, on his way to work, a day in which he was already running a little behind, there was a pigeon sitting right outside his room. Just sitting there. 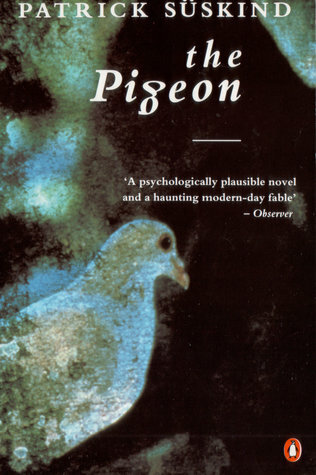 Jonathan was paralyzed with fright over the pigeon, and before leaving for the day he packs a bag with everything he needs to stay at a hotel until the “affair with the pigeon” has been resolved. The “affair with the pigeon” throws him off for the rest of his day. He’s just not himself – the security of his world, his life, his room has been shaken. We follow him through the rest of this day, chuckling over several episodes that to him are truly horrifying (the ripped pants!). Listening to his inner thoughts, which at times are a bit alarming. If he were not careful, especially in little things, and did not put all his energy into stemming the tide of such apparently trivial matters, like leaving his milk carton behind, then he would soon lose his grip entirely, and nothing would prevent his ending in misery. I was greatly entertained by this story, speeding along to find out what would happen to this eccentric man – will he be able to pull himself together by the end of the day? Susan at A Life in Books is responsible for this one. This novella couldn’t be more different from the last. There is one thing they have in common – the characters in both books are forced to leave their homes, albeit for very different reasons. In The End We Start From, the couple and their new baby evacuate their apartment because London is flooding, and they must find somewhere safe to go. Obviously, the baby complicates matters, but it is the relationship between the mother and her baby that I liked best about this book. Despite the chaos and unpredictability of their surroundings, as well as losing her husband along the way, the mother does everything she can to make sure her baby feels safe and secure. I don’t know if it was the author’s intention or not, but this book really highlights the fact that a baby’s primary caregiver(s) is his/her whole world. It is bad, the news. Bad news as it always was, forever, but worse. More relevant. This is want you don’t want, we realize. What no one ever wanted: for the news to be relevant. I try not to listen for the engine, for the way it will hum through me like a heartbeat, This means I listen constantly. There are so many different kinds of quiet, and only one word for them. The quiet in the house has matured from quiet as lack of noise to something else, a textured, grainy quiet, a thickness to stumble through. How quickly the everyday fills up time again. Glugs upwards from the earth, invisible until you’re splashing in it. Have you been reading any novellas lately? Or books recommended by other readers? If you want some more suggestions for good novellas, head over to Madame Bibi’s blog – she’s been reading a “Novella a Day in May”. Thank you for the mentions Naomi – I’m so glad you enjoyed The Pigeon too! The End We Start From sounds excellent, it’s been on my radar since Susan’s review too. From the quotes you pulled it sounds beautifully crafted but not over written, which is perfect. Yay, I’ve found you a novella to read, rather than the other way around! I loved The Pigeon! I found it so funny. I could easily read it again. Have you read “Perfume”? Yes, I really liked Perfume, but The Pigeon is so different isn’t it? I suppose they’re both quite surprising and focus closely on one man, but in terms of tone and scope they’re poles apart! I’m so glad you enjoyed The End We Start From, Naomi, and thanks for the link. I agree with your Dept of Speculation comparison which I also liked, though not as much as Hunter’s novella. I’m holding Madame Bibi responsible for the rapid expansion of my TBR list! Good idea! I’ve read more novellas than usual this year – even before Madame Bibi got to work – and I feel all the better for it. I’d like to read both of these. Have you also read Perfume by Suskind? Such a creepy little book. I think The Pigeon will be more palatable. It’s so tempting to get through a book a day in this way 😉 I may attempt a similar feat in November. Yes, I thought it was such a fun idea! I haven’t read Perfume – it surprises me to hear you call it creepy… I thought The Pigeon was so funny! I love novellas, and I have obtained most (if not all) of the ones I have read over the years from Quattro Books in Toronto (http://quattrobooks.ca/). I can identify with Mr. Noel in The Pigeon. My first accommodation in Toronto was a rooming house with a shared bathroom. I too would listen from inside my door before opening it. My room was closest to the bathroom, so I could get there fast enough before the other tenant did! 🙂 Never had a pigeon problem though. What a great story – I think you just might have to read The Pigeon! And thanks for the tip about Quattro Books! I thought the covers for both of these were so great! I love them all! I love novellas, but they are that weird genre I scrutinize extra hard because a novella CAN NOT be a bloated short story or an incomplete novel. When it comes to shorter works, I am a harsh judge likely because my MFA program (and most MFA programs) focus on shorter works, so that’s where my mind is. Haha! A Lot of people must be afraid of birds. That’s new to me! 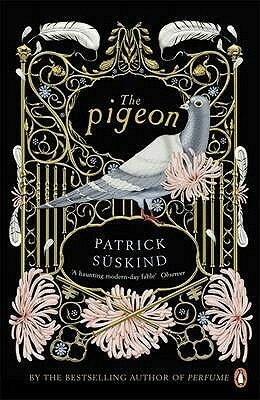 Oddly enough, I was just thinking about Suskind the other day as I was recommending another of his novels – Perfume – to a friend. (Fortunately, he’s really enjoying it.) The Pigeon sounds very different but no less intriguing. Nice review, Naomi. And now I am leaning towards trying Perfume! I thought Perfume was great so I’ll have to hunt down a copy of The Pigeon. Sounds like a good read. 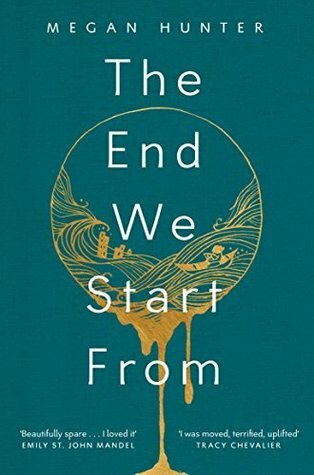 I read The End We Start From last autumn and didn’t love it. I felt like it lacked detail. However, I also read it just days after my daughter was born so I also found it very stressful! That *would* be stressful! Imagine having your baby during a time of turmoil and evacuation. You should definitely give The Pigeon a try, especially if you liked Perfume! I know! Giving birth/having a newborn is hard enough as it is! You’ve reminded me about The Pigeon! My interest was piqued by Mme Bibi’s review a while back too. It really sounds wonderful, and being short should be easy to wedge into my Tbr pile! I read through it so quickly – it might have even been one day (which is very rare for me). I just happened to look it up at the library after reading about it to see if we had it (expecting that we wouldn’t), and there it was! I finished recently On Chesil Beach, which some people consider a novella. It’s 166 pgs but could be just a short novel. I like short books so novellas seem to fit me. 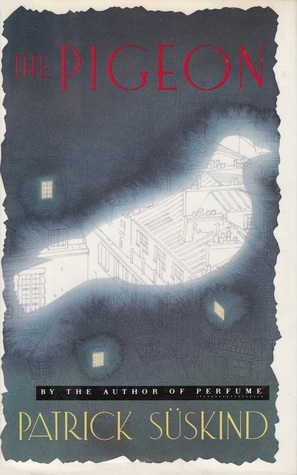 I like the last “Pigeon” book cover! On Chesil Beach is a good one! I’m so curious to know how the movie compares! 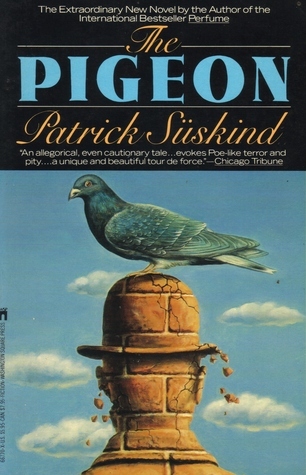 Some of the covers for The Pigeon are great! 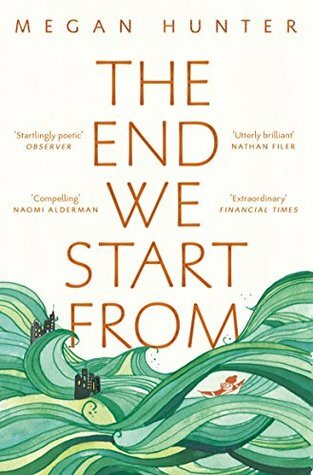 Oh: I’m reminded of Stephanie Domet’s The Homing, which would flutter into this group with such panache (but it’s longer) (but, still, you recommended it, and I read it, and I loved it, so there’s that). The idea of focussing on novellas for an entire month sounds amazing: what a terrific project (and a terrific TBR, as you’ve mentioned)! Well, it’s not surprising that the library shows no sign of The Finest Supermarket, but I have added it to my list and will eventually track it down! What would they do at your library without your recommendations to assist with collection-building!